My childhood and growing-up years were haunted by fire – a thing which I have been reminded about, on reading the horrific accounts of the fast-moving fire that swept a resort town on the eastern shore of Greece’s Attic Peninsula earlier this week, and on reading about the massive Carr Fire just now threatening whole tracts of northern California. I grew up in Southern California, living there until I enlisted after college, went away and never really returned for more than a couple of weeks. (Less a single year to the day at Mather AFB in 1981-82.) My parents loved living in the hills, preferably at the end of a dirt road; if not out of sight of a neighbor’s fireplace sending up a little plume of smoke – then on at least half an acre and that far distant from their rooftop. Dad was a research biologist. He gave the most wonderful nature walks imaginable, and would have been – as he once confessed, being happy as a desert rat, living in a hut in the Mojave. This meant that we were usually living in, or within sight of California chaparral-covered hills – hills which nature has designed expressly for the purposes of burning over, every twenty or thirty years. There is no escaping that unadorned fact. Fire governs the wilderness. Certain of the native plant seeds do not even properly germinate until heated to so-many degrees. The plants themselves are resinous and burn readily, when the hot wind desert wind blows. This I knew, early on. The standing old-growth forests, and even the newer pine-woods other parts of California and the west – they are governed, bound, ruthlessly maintained by cycles of naturally-occurring fire and renewal. Fire thins the new seedlings, eliminates disease-weakened trees, clears away the mast and muddle – the broom that ruthlessly sweeps away, and renews. This my father taught us. A lesson which certain environmental groups seem to refuse, with the energy of a small child refusing a spoonful of delicious creamed spinach. No! Don’t cut down those pine-bark-infested pine trees! No, don’t clear-cut that brush! It’s icky interference with nature! And don’t do controlled burns, which endanger the spotted lizard-owl something! So the burnable load increases, increases and increases again, and when it finally all goes up, it burns so hot that the earth turns clean and barren, like a kiln transforming clay into pottery. Nature deferred will extract her penalty. Knowledge of fire hazard is something which we lived with for many years. There were precautions to take, of course. Care with open flame of any sort, care with clearing away brush and plantings from buildings, care with even building to start with – and ceaseless vigilance in fire season, when the devil wind blew in summer and fall, and the brush turned so tinder-dry that anything would set it aflame; a cigarette carelessly discarded, a steel bulldozer-blade striking a flint rock, a shorted-out string of Christmas lights. A campfire getting out of hand. A stupid neighbor boy monkeying around with a firework. That last one set half an acre above our house in Tujunga on fire, even though we called the fire department as soon as we heard the firework sizzle. Of course, we – and a good few neighbors – were on hand, fighting it with wet towels, buckets, garden hoses, even before the city fire crew appeared. Get the fire small, before it grows, because – if it grows, half a hillside can disappear in a tornado of flame. I saw one of those, once. Through Dad’s binoculars – from the hilltop above the house where I lived as a teenager. About the whole of the Angeles National Forest burned that year, it seemed like. It came over the crest of the mountain range above Sunland Tujunga, in a line of fire as far as we could see across the horizon. 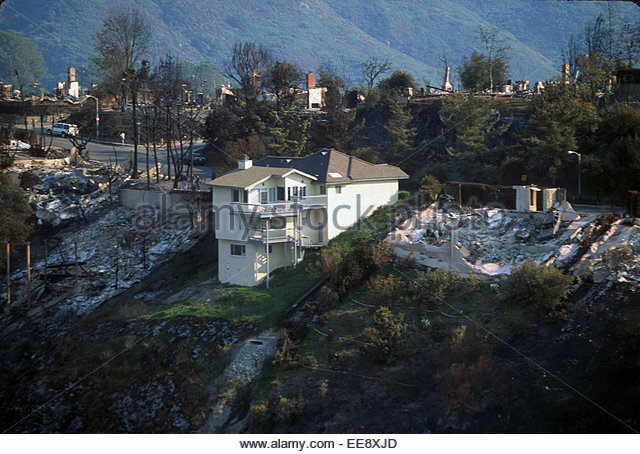 The fire burned down the hillside, and in one steep canyon, it struck the right combination of conditions to turn into a fire tornado. That’s what it looks like – a tornado of flame. Through the binoculars, I saw the wind of the fire tornado sucking stuff into it, as it moved downhill. I couldn’t hear the noise that it made; this was at a distance. But I knew the sound. Some of the news reports have made mention; that a fast-moving wildfire makes a particular heavy roaring sound. It does, and it’s terrifying to hear. And to see that the fire is moving faster through the brush, or pines, or whatever – faster than someone can run. And the smoke is horrific. It pours off the fire like water in full-blast from a fire hydrant, a pale orange-beige color. In a short while from a fire starting, it mounts up into the sky like a thundercloud – like a thundercloud, swiftly blotting out the sun, and turning the sky a nasty color … sometimes so thick and dark that automatic streetlights switch on in mid-afternoon. And wisps of ashes begin floating down, blowing like dry snowflakes, wherever the hot wind takes them. The Carr fire in Northern California’s Shasta and Trinity Counties has burned nearly 90,000 acres, and as of Sunday is reported to be only 5% contained. Likely even more will be burned, even as other fires scorch the earth around Los Angeles, and northern San Diego county. The fire that flashed through the holiday resort town of Mati, on the eastward side of Greeces’ Attic peninsula seems to have been extinguished. When I was stationed at Hellenikon AB in the early 1980s, I rather preferred the beaches on that side – they were cleaner, less crowded than the ranges of beach on the Athens to Sounion side. I don’t believe I ever was in Mati – although we did visit Marathon at least once. I favored the drive to Vauvrona for the beach there – and ancient Brauron, which boasted an ancient temple dedicated to Artemis – and Porto Rafti, which was the location of a seafood restaurant favored by my next-door neighbors in Athens. They served up fresh-caught fish, roast over an open grill every day, garnished with nothing more than salt and lemon, and a side of French-friend potatoes, and when they were out of fish, the place closed for the day. Both Greece and Southern California had the same kind of vegetation clothing the hills – low-growing dark-green chamisa; sages and wild salvias, gnarled scrub pines. In a dry summer, with a furnace-hot wind blowing, of course it will all catch fire and burn, flashing over the tops of trees and brush faster than a person can run. I have never gotten over the habit of looking around when I hear a fire engine – looking for a plume of beige-grey smoke rising into the sky, even though it has been going on twenty-five years since I lived in fire country. This entry was posted on Sunday, July 29th, 2018 at 2:22 pm	and is filed under Current Events, Deep Thoughts, Environment, Europe. You can follow any responses to this entry through the RSS 2.0 feed. Both comments and pings are currently closed. Well, Mom, it damn near happened to me. Two nights ago I was looking at a bright orange glow on the end of my street and thick smoke and ash coming down like snow and started throwing stuff in the truck (reloading components first). Then family photos, old books with dedications from long-dead friends and family — the irreplaceable things. All the *really* precious things were in one or two dresser drawers (this isn’t my first rodeo) and my truck bag already had some water and TP and other necessaries. I figured this was it. But God decreed otherwise, and it jumped the river and went north. It sure as hell wasn’t anything the firefighters did. They couldn’t. They said so. They had given up on ‘fighting’ and were simply evacuating people. I recall thinking I should take a picture. But I hate the whole rubbernecking/selfie thing, and the thought seemed deeply repellent to me at the time. I did think of it, and now I wish I had. All I have as a memento is the charred oak twig that I found in the front yard, the leaves charred but still intact. Redding proper would seem to be safe now, though the wind could always shift. The stuff in the truck is now in my living room. I can actually kinda-sorta see the sun now. But they still haven’t let the housing developments on t5he other side of the river go home yet, and I won’t feel entirely at ease and put the pictures back on the wall and the guns back in the cabinet until they do. I don’t dare go anywhere near the mass media, or social media, or anything else. I know from experience that the blue-state gloating over those red-state bipeds getting their proper comeuppance is off the charts. That’s about it so far. Stay tuned. The wind can always shift. But the Lord has been very kind to us so far. Stay safe, Phil. The CA FD website said it was only %5 contained. My parents lost their house in 2003 – and had half an hour to grab stuff. Dad shot pictures of the house interior, with an eye towards the insurance claim, and one picture of the fire coming up the hill towards them. They got out safe, with their pets and some of the irreplaceable things, but the house burned, all but the conblock exterior walls. One of the short videos from Mati shows people standing in water up to their shoulders, while the fire rages on shore above them. One woman has a small pet carrier, she barely has it clear of the water. Small dog, maybe – or cat. If so, that cat was very pissed. At a British site I frequent, “S.Weasel”, there was mention of a 60 acre fire in cropland not far from where they were a few days ago. My relies follow. Note that the “Scoffing” was in a friendly tone, a’la Monty Python. Our fires in Colorado are of the forest variety. Northwest of us we had the Weston Pass Fire [14,000+ acres closing a US Highway and threatening towns], South of us we have, repeat have, the Spring Creek Fire [110,000 acres closing a US Highway and threatening several towns], In the SW corner of the state we have 4 fires, the largest of which is the 416 Fire which is 55,000 acres and has been burning since June 1, due North of us was the Chateau Fire, which was about 30,000 acres. There are about a half dozen other fires in the north part of the state, which I am not tracking actively. The Chateau Fire was started by several teenagers who did not think a State and Federal Stage II fire ban applied to them. The Spring Creek Fire was started by an illegal invader who may not be tightly wrapped. Teenagers and invader in custody. The rest were started by summer lightning in the mountains. Oh, and a couple of weeks ago we had a small forest fire of about 40-50 acres about 3 miles as the crow flies from my house, but the local FD got it under control in 24 hours. I scoff in the general direction of your 60 acres on flat ground, with road access and flowing watercourses not far away. I have been ready to put up friends and family as needed all summer. Fortunately, none of ours has lost their home. A lot of people have. June 11, 2013. The entire state of Colorado was cloud free, albeit windy. Within 45 minutes fires started in the Black Forest area north of Colorado Springs, the Royal Gorge Area west of Canon City, in a prairie field on the east side of Pueblo, and in the mountains near La Veta. In Fremont [Royal Gorge] and El Paso [Black Forest] Counties, I know the Sheriff’s Offices located the points of origin to within 10 feet. The SO’s were forbidden by Federal authorities to discuss it. I just happen to have, about a foot to the left of where I sit, a looseleaf binder with a xeroxed copy of an Al Quada tradecraft manual that was posted online over a decade ago. The mention in it of starting wildfires as a tactic is purely coincidental, I’m sure. I note that our Spring Creek fire is 110,000 acres, albeit it is coming under control as our summer “monsoon” in Colorado is giving afternoon rains that are helping with all our fires. I have heard reports that the Mati fire apparently has multiple simultaneous sources of ignition. Which cannot be accidental. If that is true, I hope that the perpetrators end up in the hands of the victims for a long and unpleasant time. Similarly, there are reports that at least some of the fires in California were set. I don’t know if the arsonists were some of the transient, mentally and emotionally impaired that California values more than productive citizens, if they were religious devotees of Mother Gaia who were trying to punish the evil humans for living in the mountains, or if they were hostile illegal invaders. If they were any of those categories above, we can be sure that it will never be allowed to hit the news. Also, we can be sure that the decades of neglect of forest fire management will somehow be blamed on Trump. It’s been noted that some of the most recent fires may have been started by illegals, camping on public lands. The fire that took my parent’s retirement house in Valley Center in 2003 was sketchily reported in local news to have started on local Indian Res land; a campfire which got out of control. Yes, indeed – there is some stuff which is never allowed to hit the mainstream establishment news. The cause of various catastrophic fires will very likely turn out to be one of those things. Sarge, don’t worry about it. While various bits of software sometimes leave me P.O.ed, it is not the fault of the people who are enduring it the same as I am. Not your fault. I long ago learned to not trust any machinery more complicated than chopsticks. Might have to depend on them, but never trust them. Also, I am not under the illusion that anything I say online is of such crucial importance that it cannot be delayed. The 1961 Bel Aire Fire destroyed my wife and my wedding presents and her wedding gown. Also her parents’ house. I remember walking up the fairway of the Bel Air Country Club watching houses on both sides burn with no firemen around. They were 20 miles west trying to create a firebreak. There were some interesting aspects that were not reported. First, a resident had sold all his neighbors fire insurance. 476 houses burned and the insurance company went bankrupt. Many of my in-laws’ neighbors had had their insurance canceled a week or two before the fire. On such neighbor hid when the police came through forcing people to evacuate. He then went around tearing down wooden patio covers and kicking in doors so he could tear down draperies. Both actions saved houses. The heat broke windows and then sucked out draperies which ignited and brought the fire inside, even of the house was not at risk. Shake roofs, which my in-laws had, were fatal. They also had a wood patio cover, The houses next door on each side had rock roofs and survived. One fellow across the canyon, a neighbor of Burt Lancaster, submerged in his pool and watched his house burn. The great grandmother in Redding needed a pool. Here in Sacramento the sky was smoggish from the fires up at Redding, 160 miles north (or more). I can remember a massive fire in S Lake Tahoe – what – 10 years ago? – and it was horrible here – like smog. That fire was exacerbated by the Tahoe Regional Commission prohibiting the clean up of dead trees. Then there was the fire in Napa last year. A friend of mine had a beautiful car collection – and it was the only think saved – house burned down. People in this area all want to live in the foothills which unless a big effort is made annually to clear an area around the house, become fire traps. I’m not the least surprised to hear that, Gurray – when Mom and Dad were burned out, they came away from the house with basically the clothes they stood up in that morning. It was the same for most of the other people who lost their homes in that fire. So, one of the local churches stepped up – and gave each family who had been burned out a small money grant. About $75 dollars in cash, if memory serves. No strings attached, no application, given within a day or two – just here, use it for immediate small expenses. Mom appreciated that one little grant more than just about any other. when Mom and Dad were burned out, they came away from the house with basically the clothes they stood up in that morning. When my in-laws house burned in 1961, my wife’s mother was in Australia so that car was saved as she was driving it. Her father had just gotten home from a business trip and had dropped his dirty clothes at the cleaners. That was what they had left. Her mother had her clothes in Australia. We had a small apartment and had stored all our wedding gifts at the parents’ home so they were lost. A neighbor had taken all their precious things and left at another neighbor’s house for safe keeping. Their house was spared and the neighbor’s house, with all their treasures, was destroyed. I grew up at the end of a cul-de-sac on a dry hill and always feared that a fire would roar up the hill leaving us no way out. Some of my classmates in high school lost their homes that way. It’s something we’ve always had to deal with in California, but something seems to have changed in recent years. Many more people lead to many more fires set by some idiot and much more property to destroy. Poor decision making by politicians and regulators contribute as well. My brother in law had a brush clearing business and was always called upon during fire season to build fire breaks. The state kept adding more stringent requirements to his equipment until he pulled up stakes and moved to a different state. It sure would be nice to have him helping put out the fires now. I was a volunteer fire fighter in the mountains just West of Colorado Springs for 8 years (2007 to 2015) and was the Chairman of the Fire District BOD for 7 of those years. Our mountain development was totally evacuated (except for the Fire Dept.) for several days in June of 2012, due to the Waldo Canyon Fire, which eventually burned over 29 sq. miles, destroyed 348 homes (mostly within the city limits of Colorado Springs), and killed 2 people. Our Fire Department acted as lookouts for other Departments from our high elevation staging area and did structure protection in Manitou Springs and Colorado Springs. The Waldo Canyon Fire had a strange origin. A resident of our community was the first to report the fire….on the evening before it officially began. Late evening, our Deputy Chief and myself responded to the smoke call and observed smoke coming from an area across Ute Pass from us. There was no wind and the smoke was rising straight up in puffs, like someone was adding wood to a campfire. We reported this to the crew of another Dept. that was hiking up the slope, trying to find the source. We also vectored the spot (the Deputy Chief was a retired Army LTC) by putting stakes in the ground on a line to the smoke. Eventually the responding crews turned around because they couldn’t find any evidence of a fire and it became too dark to see. The following day just before noon, the fire broke out in this exact same spot. I watched it grow in the hot, windy weather as brands flew hundreds of yards, igniting spot fires well in front of the main fire. This was all on a very steep south-facing slope, totally inaccessible to fire crews. Like stated above for the following year, other fires were breaking out around the region at this same time. There was no lightning during this period….the fires were considered by almost everyone in the fire community to be clearly the work of arsonists. Terrorists?….maybe. It requires no sophisticated equipment, no explosives, nothing but a book of matches and some tinder to create chaos, hundreds of millions of dollars in losses and deaths. There are also relatively simple ways to start a fire and be long gone by the time it gets going. I’d be shocked to learn that this tactic has never been used by terrorists. There has never been a cause determined for this fire (or the Black Forest Fire ). I personally talked (twice, and at some length) to the lead investigator on this fire. He told me they were close to a solution, but one has never been disclosed and probably never will be. I have been told that the government is extremely reluctant to give terrorism as a cause for destructive incidents like this for a variety of reasons, not the least because it has impacts on the payment of insurance claims, especially on businesses, and especially before coverage for terrorist acts became more commonplace. I don’t know if this is true or not. Thanks, Mike – and this is something to think about. And to realize that for various reasons, the aspect of terrorism-fire is not something that various powers-that-be want to address head on. It’s interetsing, Sometimes the autofill works partly and others not at all. The Laguna Beach Fire was arson and I don’t think they ever caught the arsonist. It was very destructive. It made the career of one architect as his house was designed to resist fire and it worked. My son is a firefighter with CalFire and is now an engineer so he is not not on the fire line. and watch out for the mudslides in the next rainy season. (see Control of Nature), though that’s about Southern California. I don’t know if Northern California is subject to the same problems. An interesting side note from some research done at Camp Frank Rand north of Santa Fe NM, studying tree rings from trees cut down during manual brush-clearing by Boy Scouts. Up until the early 20th Century, trees had suffered mild fire damage about every 9 years on average; then the fires had stopped. Further research found that traditional Native American hunting practice in the area had been to set fires each year in late summer on various sites in rotation, about every 9-10 years. Come spring-time, there would be fresh green growth which would bring the wildlife to the hunters. This hunting practice incidentally helped maintain the health of the forest, although that was not why the Natives did it. Regular small fires prevented the very destructive major fires in overgrown forests we are seeing today. It seems that the “natural” environment in the American West has been human-influenced for a very long time. Not at all like you lot completely ignoring GW because it does not fit your narrative. Its hot here in BC, we might see 35c today. We are very much used to fire. One of our main resources is wood. We lose bits of our interior every year and its very much like California. We are used to burning out the trash to stop real fires in this areas. Our coast where I live is bigger wood and we are ready all the time. Right now, no campfires, no fires at all. We fine people heavily for breaking these rules. Good luck, its just gonna get worse. The idea is that both a forest and national economy are complex adaptive systems ruled by bottom-up evolution. Attempts to impose short term stability by suppressing mild setbacks or disturbances eventually results in building up to a huge system-wide catastrophe. Increased Connectivity: This is the least appreciated impact of eliminating all disturbances in a complex adaptive system. Disturbances perform a critical role by breaking connections within a network. Frequent forest fires result in a “patchy” modularised forest where no one fire can cause catastrophic damage. Suppressing forest fires converts the forest into one connected whole, at risk of complete destruction from the eventual fire that cannot be suppressed. Another good read, suggesting that Native Americans (in North and South America both) may have taken a substantial proactive role in ‘managing’ the environment to benefit their agricultural and hunting practices is in Charles Mann’s 1491.